As teachers of reading, writing and spelling in English, we use the alphabet labels «aee, bee, cee, dee,» etc. as such a familiar set of labels that we scarcely notice how totally engrained they are in our minds from childhood onwards. Some years ago, while teaching English to 6, 7 and 8-year old children in England who were falling behind in learning to read, I found myself standing back and looking at these alphabet labels from a new perspective. The closer I looked, the more astonished I became at how flawed these labels are for teaching early reading, writing and spelling skills! However, even before we carefully set up this essential looking-and-listening skill with letter shapes and sounds, we do something rather remarkable. We ask children to memorise the 26 traditional alphabet names — a set of labels for talking about the letters where no less than 15 out of 26 of them, are misleading! The sound of f is not «eh…». The sound of w is not «d…». The sound of y is not «www…», etc. Children who at the age of 8 write levn (to spell eleven), rember (for remember), prt (for party), yit (for white) or intrst (for interest) using a mixture of letter sounds and names, are doing their best to use all the information we gave them. So now they are among the thousands of 6 to 8 year olds whose initial learning of the a-z sounds has become fused/confused with their a-z name knowledge because of this misleading overlap of terms.As we introduce young children to written words and pictures, we want them to connect the black ‘squiggles' on the page to the words coming from their mouths. So early on we start calling their attention to the whole word’s shape and particularly to its first letter shape and its sound on their lips as they start to name a picture. 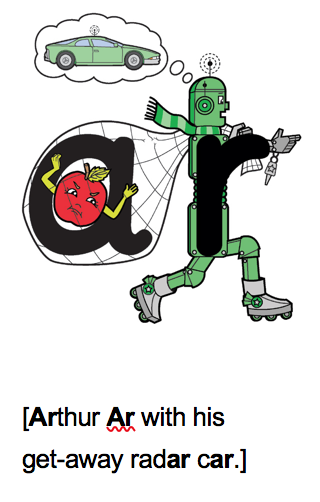 This is a vital first step in cracking the Aa-Zz alphabet code and becoming readers. Alphabet names are also a hotbed of confusion in other respects. The letters ‘cee' and ‘gee' do accurately cue their soft sounds, but they provide no information in their alphabet names to support the two far more frequently needed hard c and hard g sounds. Furthermore, not one of the five vowel names provide any clue to their vowel sounds. (And there is least one vowel in every word!) The same lack of any sound clue applies to no less than 5 consonants, «aitch, cue, are, double-you and why» (h, q, r, w, y). That’s a total of 10 out of these 15 misleading terms with NO CLUE to their common sounds at either the start or the end of their alphabet names. As if that were not enough, there is another problem built into our traditional alphabet name labels. A full 13 of the alphabet names (50%!) actually end with another letter’s long vowel name. Long vowel names built into these 13 letter names account for many misspelt syllables. For example, bside for beside, dsend for descend. As if that were not perplexing enough, 53% of the 26 alphabet names sound exactly like 14 meaningful words. Worse still, those marked in bold are 6 of the most used words in the English language. As a result, for any child beginning emergent writing, or coming to English as an additional/foreign language, the potentials for confusion built into our alphabet name system are a very serious cause for concern. 1) alphabet-naming can only be a successful reading strategy for exactly 5 letters of the alphabet (the vowels), and then only successful in words that happen to have ‘long' vowels in them. 2) Applying any one of the 21 consonant names to reading any word in the English language is a sure-fail strategy because not one consonant ever represents its full alphabet name in words. As educators, we should not be misled into thinking that we are teaching children anything relevant to reading or to emergent writing when we stress alphabet-naming as a first priority. Yet, remarkably, many countries around the world make English alphabet-name-learning as a curriculum first requirement. In the USA, currently the official government policy prioritises teaching letter names from the very beginning of a child’s school life, or even at preschool. In actual fact, our children need the letter sounds, not the alphabet names, to be the real first priority. Instead we have locked ourselves into this quaint, long standing, time-worn tradition of prioritising letter names. American teachers even call these letter-name/letter-sound mistakes ‘invented spelling' in praise of children’s resourcefulness during free writing time, for having muddled together the complicated mix of name and sound information they have been taught so far, as they attempt to express their thoughts on paper. How many struggling readers, when they get stuck on a word, attempt to sound it out by repeating its alphabet names spelling? I know Special Educational Needs teachers working with teenage poor readers who find this a common occurrence. And why? Because we taught them letter names from preschool onwards, and then taught them to parrot strings of letter names as our preferred method for teaching spelling. We never gave them a clear run in mastering symbol/sound knowledge as a first priority. In England, however, during the last 10 years there has been a significant steady change. The re-emergence of Phonics (defined as the teaching of the relationship between sounds and spelling) has finally broken away from the tradition of teaching our appalling alphabet name labels first. Agreed, it has always appeared that English spelling was hopelessly irregular, so why focus on the difficult task of teaching meaningless bits of sound first, only to stumble immediately into too many exceptions? Here’s why. It is the High Frequency words that contribute most especially to this negative reputation. Importantly, roughly 80% of English words are actually regular. So once a student has learned a key group of its less typical but often repeated letter patterns, spelling by paying attention to the sounds as they come out of a child’s mouth enables them to spell far more words far sooner than by rote memorising strings of letter-names. It would be well if more teachers of English as an additional/foreign language around the world acted on this information. By simply replacing precious time spent on drilling their children in alphabet-name learning and letter-name spelling, they will find it much more rewarding to focus on the 26 letter sounds together with the sounds made by a few digraphs like ch, sh, th, wh, and common letter patterns such as ar, er, or, ee, ea, ow and oo — in fact, to focus on teaching phonics first. By teaching phonics first, British teachers have been discovering the benefits of postponing alphabet name teaching until young children have fully mastered the sound-symbol equation. In June 2007, the then Minister for Education, Jim Rose (now Sir Jim Rose) was issued a knighthood by her Royal Majesty, Queen Elizabeth, for his services to literacy. His research into best school practices laid the foundations for a new National Curriculum which embraced sweeping changes including its strong emphasis on what was then described as ‘Synthetic Phonics' first. 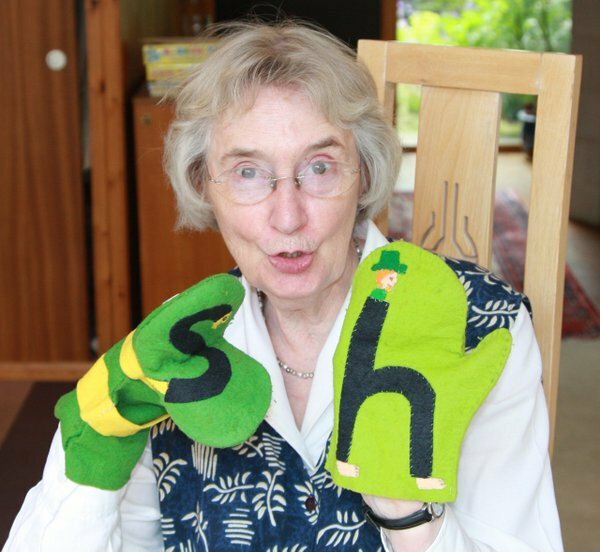 In May 2011, the UK Department for Education’s National Curriculum included an obligatory Phonics screening check to ensure children were taught the letter sounds as a top priority. Letter names testing in the first year of school has been dropped. Instead schools' first emphasis is on letter-sound knowledge, and all parents of children in British schools are advised to support this emphasis from the start, and to postpone all traditional use of letter-names at home. Early Years children are given a rich experience of picture books to explore and stories at school which their teachers read to them. Then, for learning to read themselves, they are given stories created with only regular words (decodable texts). These texts give them practice and early success in using their freshly learned letter sound knowledge. This in turn leads rapidly to an understanding of how the English alphabetical code works. Then gradually they are introduced to irregular words so they can start learning to apply their letter-sound knowledge flexibly. Children in these British schools who learn letter sounds early, begin to read more advanced regular words sooner, and experience more opportunities to practice reading for meaning. Another advantage of getting children to focus on phonics first is that they regularly get additional practice in using their letter sound knowledge each time they write a word. When teachers concentrate on letter-sound-learning first, not only at-risk learners (who are most frequently confused by the mindless letter names/letter sounds overlap), but every child can move sooner into more useful and meaningful literacy activities. Why allow tradition to double the initial learning load? British teachers are halving it instead, simply by ensuring that the far more vital skill of blending sounds into words is mastered first. And the best current phonics programs are delaying alphabet-name-learning until the key skills of decoding (reading) and encoding (spelling) words have been fully mastered. There will always be children who can handle learning both names and sounds simultaneous without confusion, but our greatest responsibility is surely to those children who are caught out by the numerous flaws in our traditional alphabet name terms, again and again every day. We need to realise that our decision to require letter name knowledge first, or even simultaneous letter name and letter sound mastery is misconceived because the number of potential confusions we unwittingly lay in young children’s path makes us the agents of their failure and disaffection in the critical first stages of learning to read. Three children under three years old can be quite a challenge. I loved those early family years, but I can tell you there wasn’t much time for anything else! When our little flock gradually reached school age, I wanted to take a teaching job. «No way,» said my husband, whose job was a 2hr journey away from home. «What if they all get measles or mumps or chicken pox and you aren’t there!» Looking back, I can see that his insistence that I be a stay-at-home Mum set the course of my life in an unexpectedly fascinating direction. I did take up teaching, but only very part time, just seeing a few children on a one-to-one basis who were struggling to learn to read. Reading, I quickly realized, is the one area of the school curriculum no child can afford to fail because without this skill he or she is excluded from the rest of the curriculum. The term dyslexia was just coming into circulation. A range of other more major and more minor learning difficulties, not yet labeled, have since become better identified. My dilemma at the time (1964) was that even though I could not understand the reasons why children have reading difficulties, I still had to DO something about these particular children who were relying on me to help them. I could not find any good published materials, so I started making my own. Kitchen table stuff, except that we didn’t have a kitchen table in our small kitchen, so it was the dining room table that I filled with papers and drawings, and then I had to clear everything away every time we sat down to eat! More than 45 years later I still have that problem (even though we have a bigger dining room table), because in those intervening years making sure that all children have a safe passage to literacy has become a continuous passion. Our dining room table is still the drawing board for ideas, sketches, puzzle designs, stories, workbook plans, video scripts, and more recently voice-over scripts to go with animation in our new software for schools. Only now it all happens under the umbrella of a company which my husband and I formed back in 1968. At first, we called the company Pictogram Supplies and found secretarial help among our neighbours in our village. I designed a box of cards, the first Teacher’s Guide, some wall charts. I learnt about printing and production, wrote lyrics for songs, commissioned music, and even designed the boxes to protect the various items in the post. When orders came in from teachers who had read several articles I wrote about Letterland, or attended talks which I gave, I packed the products and took them up the road to the local Post Office myself. I remember with pride when we qualified for a Post Office van to collect from our door because we were sending out over 1000 parcels a year. Cutting a long story short, our little home business grew and grew! We realized we weren’t just suppliers. We had become publishers. So, we changed our name to Letterland Ltd. We didn’t have any sales representatives. The children and their parents and the teachers who used the system just spread the word because it worked. Both then and now, many British, Scottish and Irish teachers like moving abroad for a year or more of teaching overseas, and because they tend to take their Letterland materials with them and persuade their next schools to adopt the system, we soon realized that, what began as a remedial technique on my dining room table, was also effective for main stream class teaching and for teaching English as a foreign language. Skipping in time, the name Letterland Ltd has lengthened into Letterland International Ltd, and the books, games, workbooks, activity books, puzzles, videos, DVDs, cassettes and CD’s and interactive software we have since produced are all stocked, picked and packed for us by a large warehouse and distribution company. Orders come in and parcels go out to over 100 countries. We are always intrigued to learn how very different the teaching circumstances are from here in England in some of the far away classrooms where Letterland is now also taught. In Hong Kong, for example, where the schooling is all in English, both learning to speak and to write in English traditionally starts at the age of 3 — or even before. While it is well understood that for learning to speak another language, the earlier the better, the tradition of starting to learn to write in two languages so early on can be quite a steep learning curve! To lighten the load and make the written English part of it more playful and fun, many Chinese pre-schools and Nursery groups in Hong Kong have adopted Letterland. We have also learned that the Letterland approach works particularly well in the Australian bush where teachers find the Aborigine children’s school attendance is poor unless they like being at school. They just don’t come. However, in schools using Letterland we are told the attendance record is usually high. It turns out that story-telling is the traditional mode of learning in the Aborigine culture, so these children readily take to Letterland’s way of explaining all the phonic facts through story-telling. We have learned of Tibetan boy monks being taught with Letterland by American teachers in Tibet. Recently we learned about a group of Ethiopian farm children who at the age of 8 had never worn shoes, never attended school or held a pencil. When their parents immigrated to Israel to escape the war in Ethiopia they were placed in an all Hebrew curriculum school. They struggled to learn Hebrew, but progressed in learning English by leaps and bounds with Letterland’s phonic approach, so that by their final term in their first school year they could read almost any simple three or four-letter English words, and a number of High Frequency irregular words as well. There are many other situations I could describe, in Russian Siberia, Canada, the United States, Jordan, South Africa, India, Egypt, Australia, New Zealand, South Korea, China, and more, where outstanding teaching is being done around the globe with Letterland. To me that speaks of an enthusiasm which has been fostered by excellent teachers, pre-school leaders, and supportive parents, who feel able to back up the school lessons at home because rule talk has been replaced by story-telling. 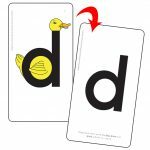 I believe that one of the reasons for Letterland’s continually growing success is the fact that, right from the start, Letterland teaching has always by-passed the need to use alphabet names, so young learners are spared all the potential confusions sited at the beginning of this article. Unlike the alphabet names which need to be learned by rote and repetition, even very young children learn the Letterland character names very quickly. Why? Because the Letterland names have meaning, and they relate to letter shapes that have come alive in children’s imagination. Youngsters also learn the important a-z sounds without drills and repetition. Why? Because they need only one strategy for learning all the sounds: just START to say a Letterlander’s alliterative name — then STOP. Right there, in their mouth, they have just made that letter’s correct sound! If they forget the sound later, they can just start to say the character’s name again. Actually, the best part of the Letterland story for me is the fact that so many of the children whom I have taught have contributed to the success of thousands of other children whom Letterland now helps. This is because whenever we came across some difficult fact to explain, I would ask them. 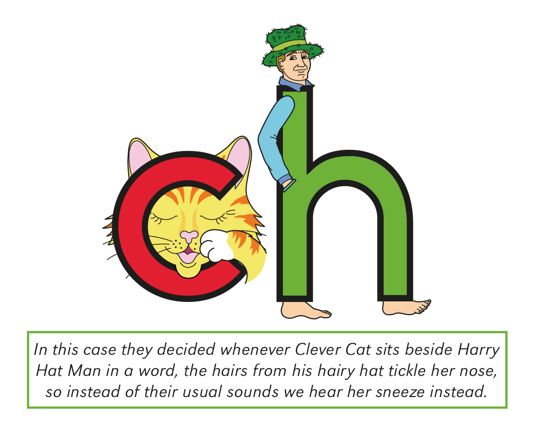 For example, c and h make two separate sounds, but together they make one completely different new sound! So I would say, «Now, how are we going to remember that these two letters make a new sound whenever they meet each other in a word? Can you think of a good reason?» And, bless them, they did! Some of the best story explanations for the many difficult phonic facts that still need to be learned after a-z,! were invented by my struggling readers. Even more valuable, they showed me that fictions could carry facts in a more child-friendly way than rules ever could! So now you can understand how my beloved husband’s determination that I should not work full time brought about an unexpected new direction to my life, and with hindsight, to the lives of many others. If I had taught full time I would never have fitted in all the work that went into developing and publishing the Letterland system. It is good, now, to see how thoroughly the system has proved its ability, in so many different countries, to make all those mysterious black squiggles that we call «the alphabet» fun and easy to learn about---even when they frequently change their sounds! Best of all the real heroes of this story are those children in my classes, because they taught me how to teach reading in a particularly child-friendly way.